Thankfully the sun has been quite generous lately here in the south west so I've been baring my arms, it's made a nice change from wearing cardigans and jumpers. So I've been paying extra attention to my visible limbs, making sure my arms don't resemble a scaly snake when they're on show. To be fair though I am relatively good when it comes to body lotions and potions, 9/10 times I will reach for a body butter or lotion after showering/bathing. My skin is quite dry anyway and if I don't use a lotion it can become even drier and therefore I'm haunted with uncomfortable itchiness. Plus I've been using self-tan recently and loving it might I add so I've been making sure my skin is hydrated as much as possible. Lush New Each Peach & Twos A Pair* massage bar is a generous size as you can tell, smells fruity and good enough to eat. I've been using this in the evening, it feels lovely when massaged into your legs. My legs get so dry and itchy if I don't use a product on them. 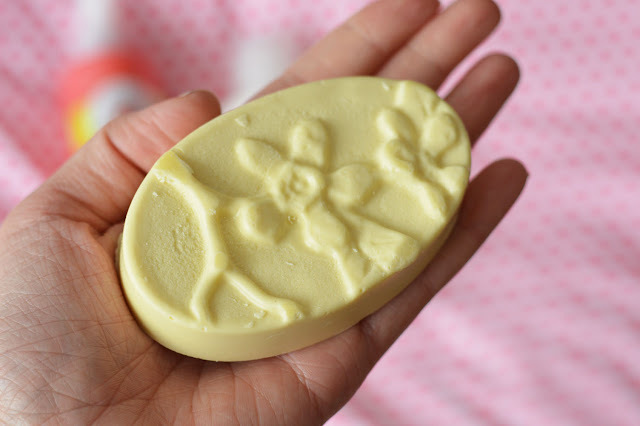 This is a beautiful massage bar packed with fruit oils, shea butter, avocado butter, cocoa butter and mango kernal butter will not let your skin down. The oval shape of the bar fits snuggly in the palm of your hand making it easy to control and apply, or if you're really lucky you may have someone who can apply it for you *wink*. 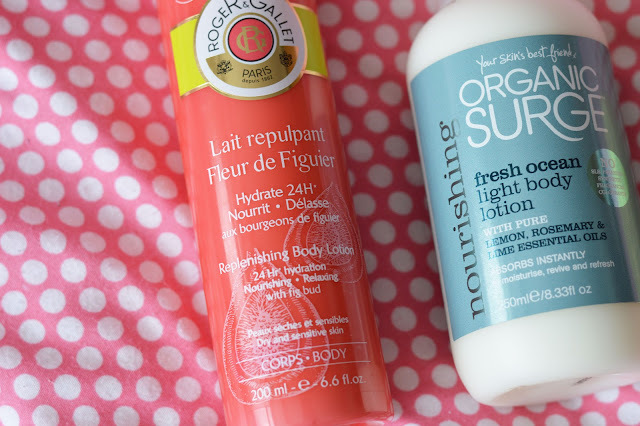 If you love fresh fruity lemony scents you need this next body lotion in your life, trust me! 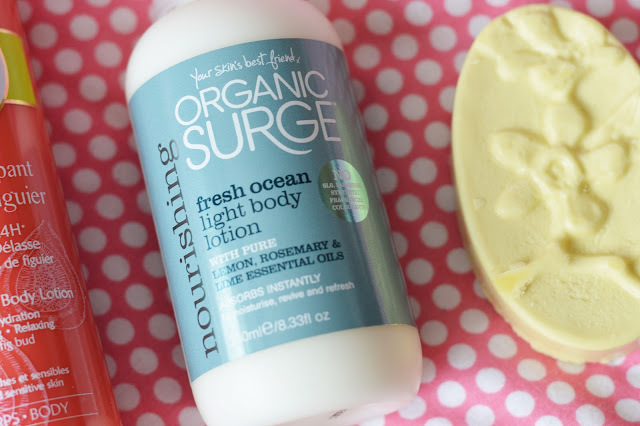 Organic Surge Fresh Ocean Light Body Lotion* (£5.99/250ml) really reminds me of lemon meringue pie, made with pure lemon, rosemary and lime essential oils. Surprisingly moisturising even though looking and feeling light weight. Non-greasy and quickly absorbed into the body, I use this in the morning. The fresh scent is great for waking up your senses and prepping your skin for the day ahead. 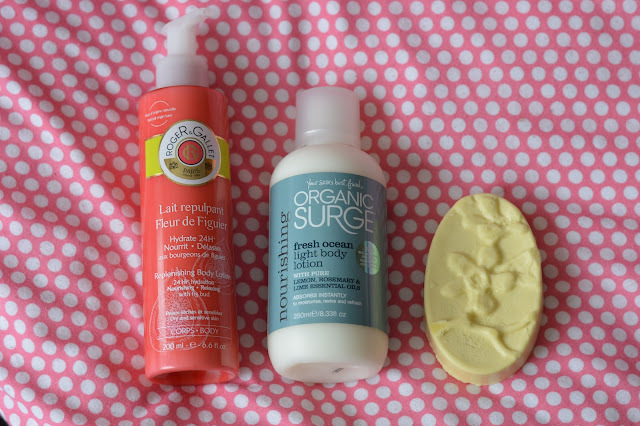 Organic Surge do not use harsh chemicals. The last body lotion is a from the new fragrance range Fleur de Figuier by Roger & Gallet, I love fig scented products so knew this would end up being a firm favourite. The scent is simply gorgeous, I would recommend the fragrance if you're a fig fan, layering up the scents would be great and of course the scent would last longer. The formulation of the lotion is nice, my skin feels soft and comfortable after using the lotion. Great for dry and sensitive skin types, the range also consists of a gentle shower cream and soap. I can see this range being very popular, available to purchase in May from Marks & Spencer beauty Halls.